Using a sound generator, record the highest and lowest frequencies that students and adults can hear. Compare to other animals. Discuss what sound is: molecules vibrating back and forth, which bump the next door molecules, passing the vibration through the air (or liquid or solid). When those molecule vibrations reach your ear, they cause your eardrum to vibrate, which transmits all the way to your inner ear, where tiny hairs move. The moving hairs initiate an electrical signal which gets sent via nerves to the auditory section of your brain. Only then do you perceive the sound. 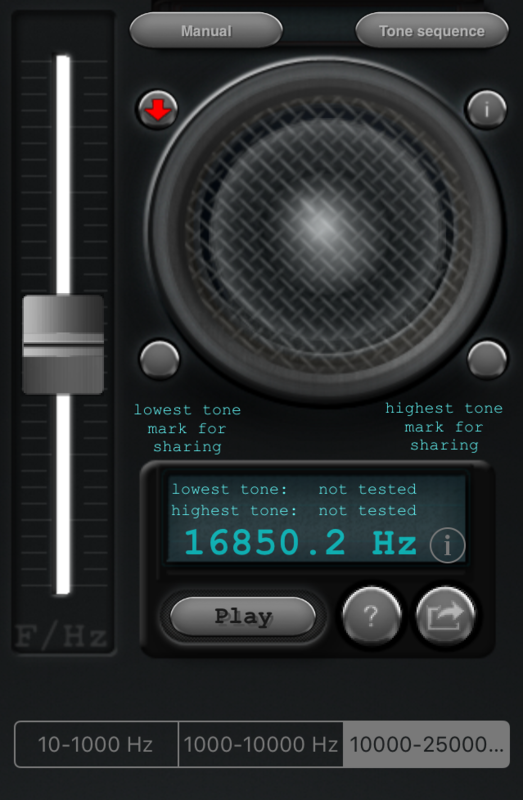 How low or high a note is depends on the frequency (or speed) of the vibrations. Faster vibrations sound higher, and slower vibrations sound lower. The rate of the vibrations are measured in Hertz, or Hz. Tell students that different people can hear different frequencies - some can hear higher than others, and some can hear lower. This activity collects data on the frequencies that students and adults can hear. Demonstrate what kind of sound they will be hearing, by turning on the tone generator and the connected speaker, and running up and down the frequencies. Start data collection. Start the frequency generator at the highest, slowly lower the frequency, and ask students to put their hand up when they start to hear the tone. If at any point, it is hurting students' ears, lower the volume (it may hurt students while adults cannot hear it at all). Discuss the results. There is a range of frequencies that students can hear, due to variability in their ear physiology. Show students a diagram of the inside of the ear and the path that the sound takes, to show the complexity of sound perception. The ear drum is vibrated by sound in the air, which transmits these vibrations through the bones of the middle ear to the liquid in the cochlea canal of the inner ear. When the hairs in the cochlea vibrate, they generate an electrical signal that neurons transmit to the brain - only then do we perceive the sound. Adults are usually unable to hear the higher frequencies that students can hear, as during aging humans lose the inner ear hair cells that are sensitive to high frequencies. Compare to other animals. 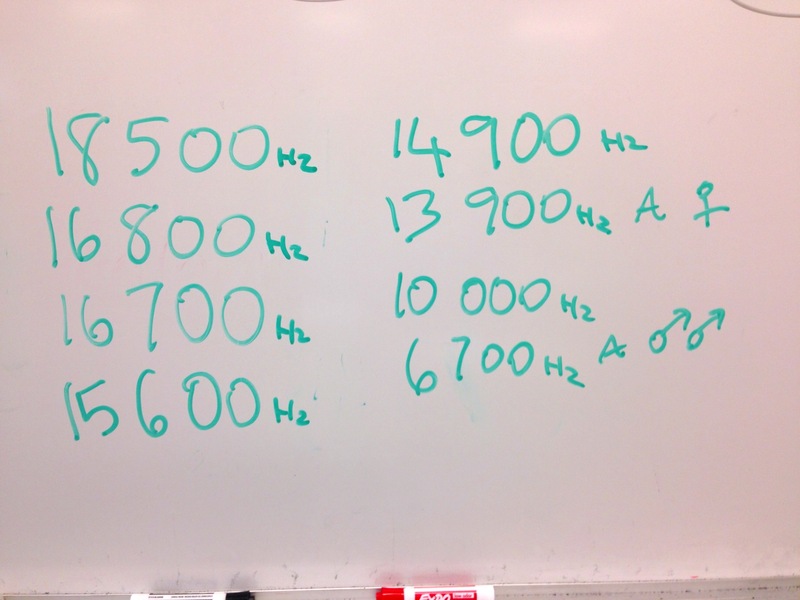 Show students a diagram of animals’ hearing range compared to humans. Humans are able to hear frequencies ranging from 19,000Hz (19KHz) down to 30Hz. Bats can hear higher frequencies than humans (called ultrasound), up to 115KHz, and use these frequencies for echolocation. Elephants can hear lower frequencies than humans (infrasound), down to 17Hz.